Florida State sophomore quarterback Jameis Winston made no commitments about his future or the NFL draft, saying that he “isn’t focused on that at all." Florida State sophomore quarterback Jameis Winston made no commitments about his future or the NFL draft after losing in a College Football Playoff semifinal on Thursday, saying that he “isn’t focused on that at all." Winston was asked after Florida State’s 59-20 loss to Oregon in the Rose Bowl about his future plans. He has two more seasons of eligibility, and many expect him to be a first-round pick if he enters the 2015 NFL draft. 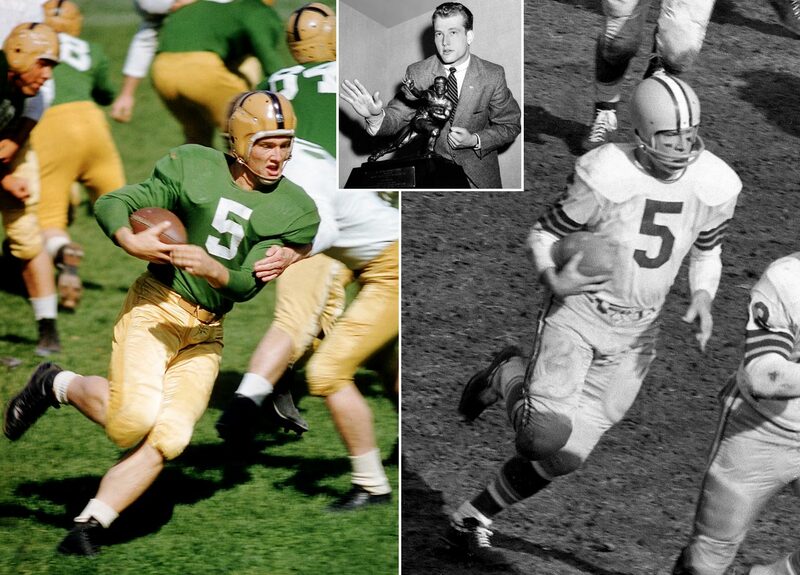 After winning the 1956 Heisman Trophy, Hornung became a key component in the Packers dynasty of the 1960s, earning Player of the Year honors in 1960 and 1961. He played multiple positions, including halfback, quarterback and placekicker. He retired with 3,711 yards rushing and 1,480 receiving yards. 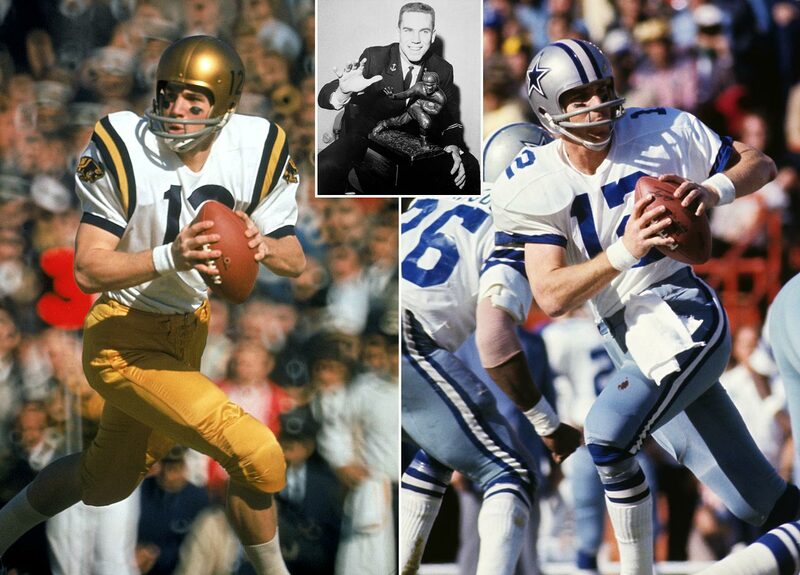 After excelling at Navy, Staubach spent four years in military service, including a tour in Vietnam. He didn't play an NFL down until he was 27. Despite the late start, Staubach led the Cowboys to four Super Bowls and two titles. He was a six-time Pro Bowl pick, led the NFL in passer rating four times and retired with 22,700 passing yards and 174 touchdowns. 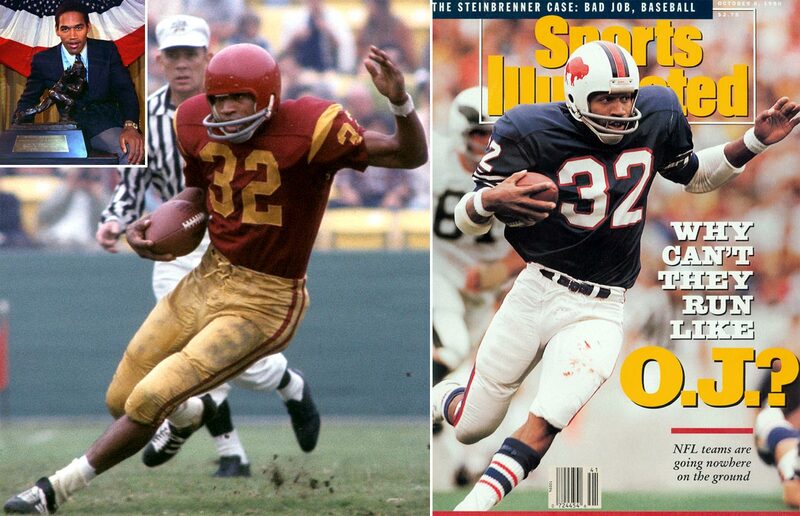 The Juice was a star at USC before joining the Bills in 1969. He struggled early in his career, but finally reached the 1,000-yard mark in 1972. He broke through in 1973, setting the all-time single season record with 2,003 yards in 1973. He continued to be one of the league's best runners until injuries caught up with him in 1977. He played two uneventful seasons in San Francisco before retiring. 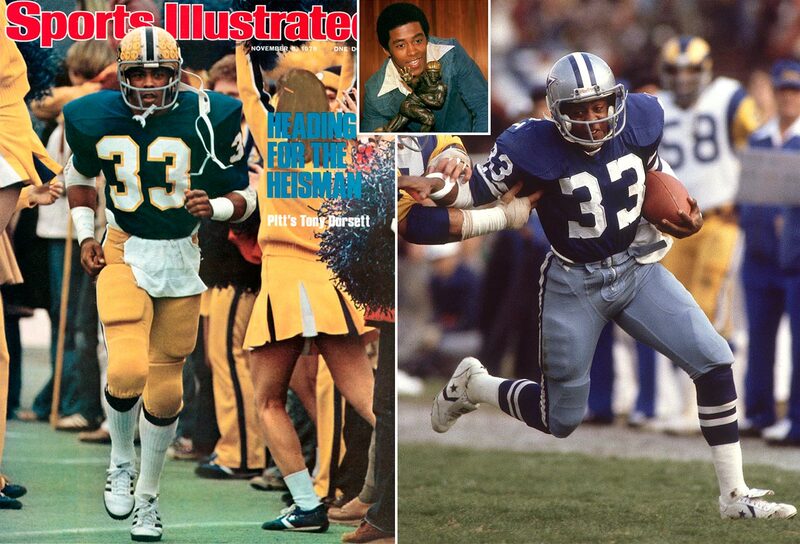 Dorsett, a first-round selection of the Cowboys in 1977, won Rookie of the Year when he ran for 1,007 yards and 12 touchdowns. He would continue his torrid pace, reaching the 1,000-yard mark in eight of his first nine seasons. Dorsett totaled 16,326 yards from scrimmage and scored 546 points on 91 touchdowns in 12 seasons. 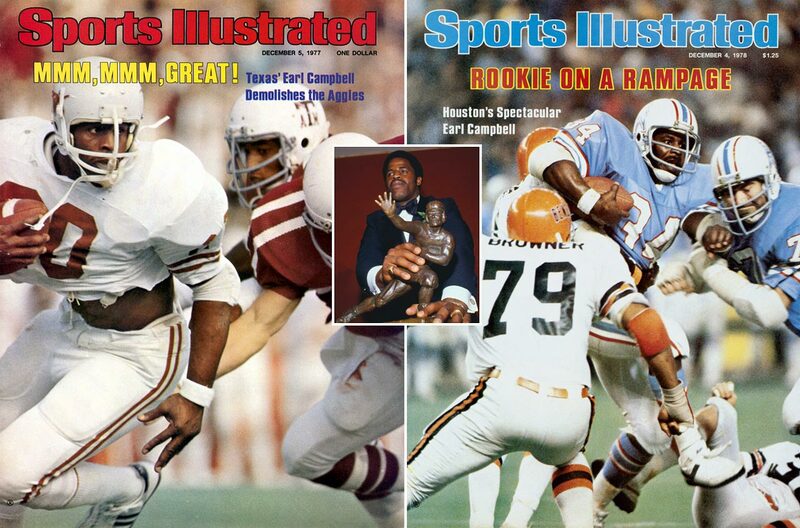 After winning the Heisman while at Texas, Campbell was drafted by Houston with the first overall pick in 1978. The bruising back made an immediate impact, rushing for 1,450 yards and 13 touchdowns in his rookie season. He led the league in rushing his first three seasons, made the Pro Bowl five times and retired with 9,407 yards and 74 touchdowns. 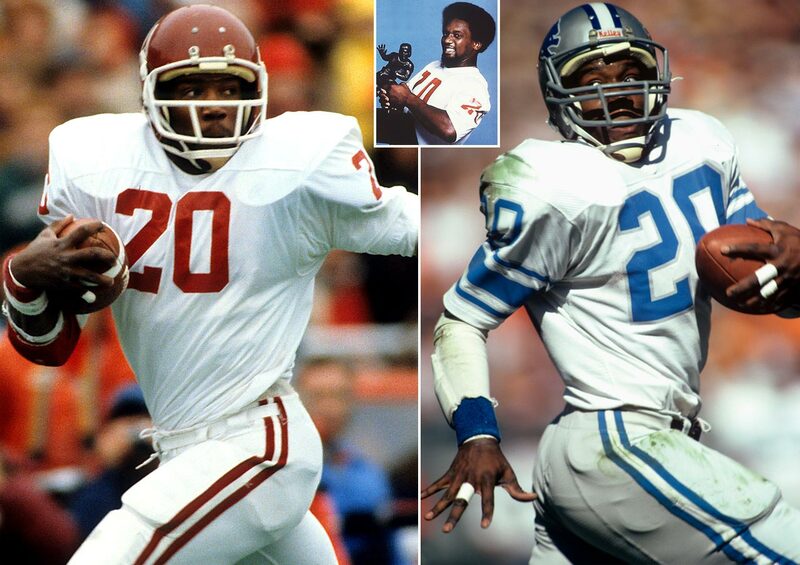 He set the Oklahoma rushing record en route to winning the 1978 Heisman, and Sims was taken with the first overall pick by Detroit in 1979. He had a strong start to his career, making the Pro Bowl team in three of his first four seasons before a knee injury cut his career short in 1984. Despite the injury, He retired with 5,106 career yards and 42 touchdowns. 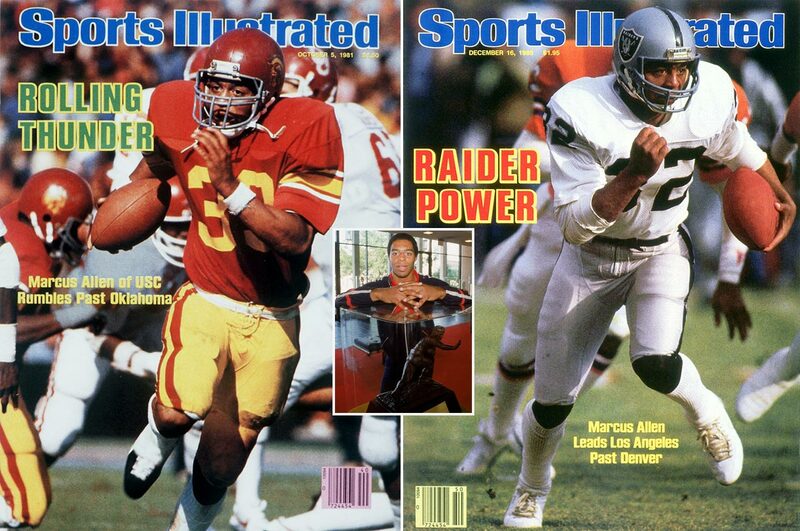 After winning the 1981 Heisman, Allen went on to star with the Raiders and Chiefs. He was the first to compile 10,000 rushing and 5,000 receiving yards. A six-time Pro Bowl back, he finished with a then-record 123 rushing touchdowns among his 145 total touchdowns. Walker won the Heisman his junior year and was drafted by the New Jersey Generals of the USFL. 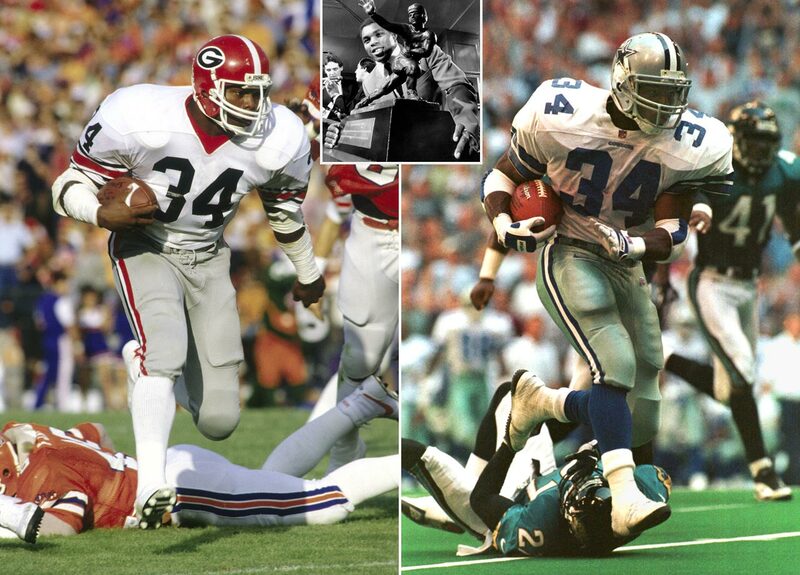 He played three seasons in the upstart league before joining the Cowboys in 1986. After three solid seasons in Dallas, he was moved to Minnesota for five players and six draft picks. He never lived up to expectations with the Vikings and would play for the Eagles and Giants before returning to Dallas in 1996. Counting his seasons in both the NFL and USFL. Walker finished his professional career with a total of 8,225 yards and 61 rushing touchdowns. He also caught 512 passes for 4,859 yards and 21 scores. 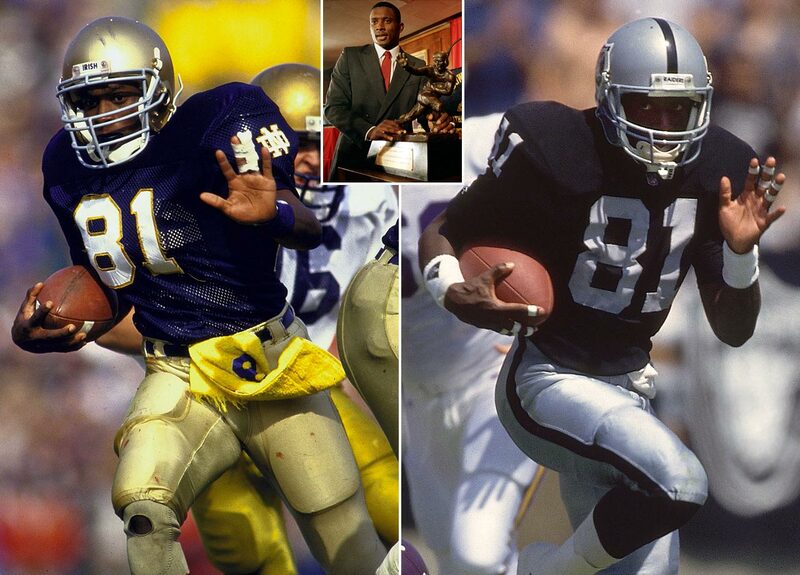 The Notre Dame standout gained 1,937 all-purpose yards in 1987 and became the first wide receiver to win the Heisman. He was drafted by the Raiders and played 17 seasons with the franchise. Brown was a nine-time Pro Bowl selection and set Raiders franchise records for receptions, receiving yards and punt return yards. 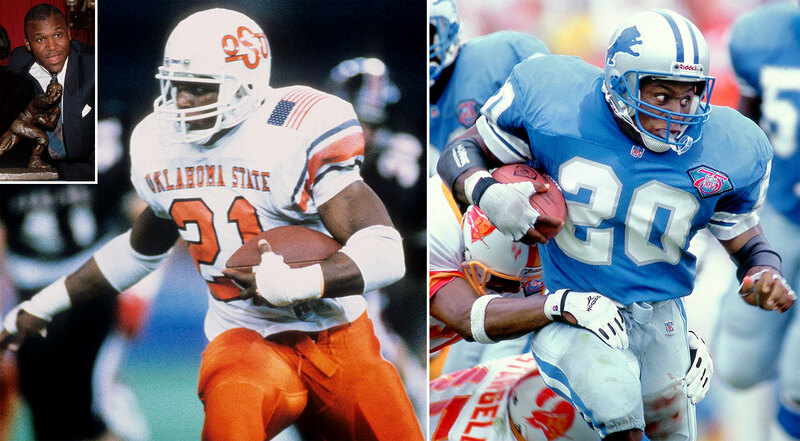 Sanders had arguably the greatest season in NCAA history in 1988, setting single-season records with 2,628 yards rushing, 3,249 total yards, 234 points and 39 touchdowns on the way to the Heisman. He continued the torrid pace in the NFL, making the Pro Bowl all 10 of his seasons and finishing his career with over 15,000 yards before retiring in 1999. 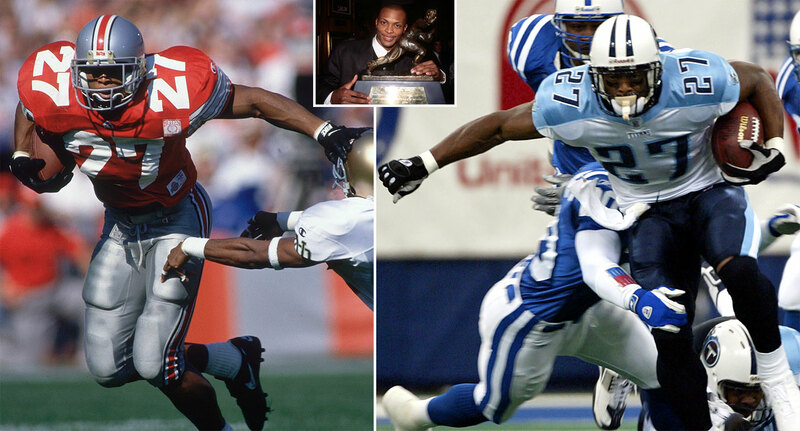 George ran for a school-record 1,927 yards and 24 touchdowns during his Heisman campaign of 1995. He was drafted by the Oilers with the 14th overall pick and went on to win Rookie of the Year honors. He started every game for the Oilers/Titans for eight seasons. He played his final season in Dallas and retired with 10,441 rushing yards, 268 receptions, 2,227 receiving yards and 78 touchdowns. 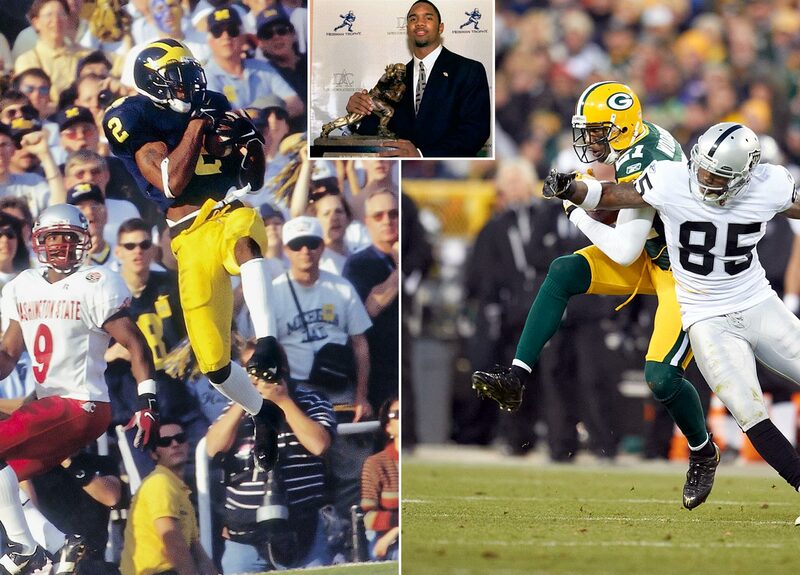 The first primarily defensive player to win the Heisman (1997), Woodson played 18 seasons in the NFL, 11 with the Raiders and seven with the Packers. He is in a three-way tie for first in career defensive touchdowns (13), along with Rod Woodson and Darren Sharper. 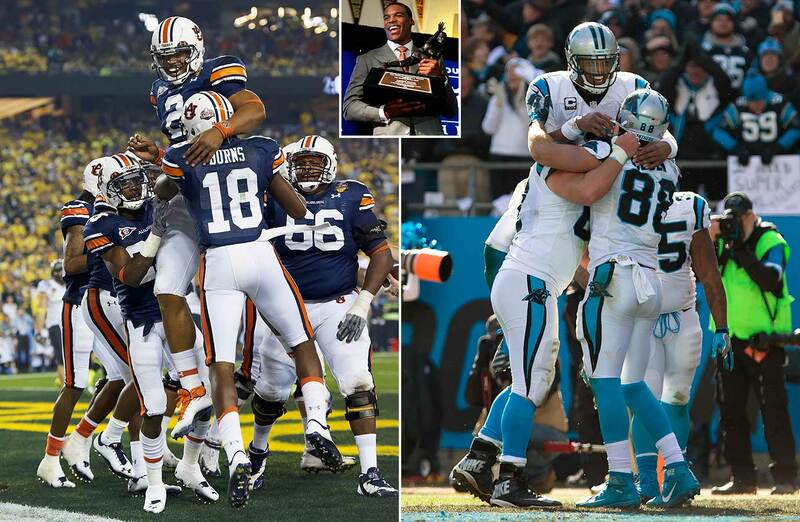 Though he only played one year at Auburn, Cam Newton made his presence felt, posting 2,854 passing yards 1,473 rushing yards and a combined 51 touchdowns. He led the Tigers to the National Championship after the 2010 season and then was selected first overall in the NFL Draft by the Carolina Panthers. In his first five years in the NFL, he passed for 18,263 yards and 117 touchdowns. He led the Panthers to a 15-1 regular season record in 2015, culminating in an appearance in Super Bowl 50 against the Denver Broncos. Winston is a relief pitcher for the Seminoles baseball team and went 1-0 with a 1.08 ERA, seven saves and 31 strikeouts in 24 appearances last season. Winston, the 2013 Heisman Trophy winner, suffered his first defeat as a collegiate starter against Oregon, completing 29 of 45 passes for 348 yards with one touchdown, one interception and a lost fumble that was turned into a 58-yard touchdown return for Oregon. He completed 65 percent of his passes for 3,907 yards, 25 touchdowns and 18 interceptions this season.